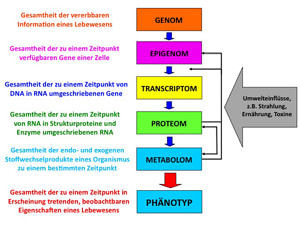 Based on the genomics technicque, which deals with the analysis of information of living organisms which is inherited from generation to generation, proteomics and metabolomics relate the identification and quantification of all protein molecules and metabolites in tissues and body fluids such as blood and urine. In contrast to the genome, whose composition remains almost unchanged during a lifetime, the qualitative and quantitative composition of the proteome and metabolome change continuously in response to genetic and non-genetic influences. In particular, the composition of the metabolome is strongly influenced by the physiologically occurring bacteria in the gut that make damaging substances such as indoles and cresols among others for the kidney. The wide variety of physicochemical properties of proteins and metabolic products represent a particular challenge for the analysis. 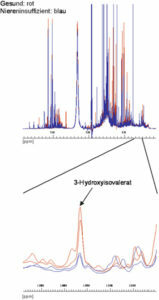 Rather are a variety of separation techniques such as electrophoresis, liquid chromatography and gas chromatography and nuclear magnetic resonance spectroscopy and mass spectrometry are used. The computer-assisted analysis of the proteome and metabolome then maps the actual functional state of an organism as a result of genetic targets and currently acting physical, chemical , biological, dietetic and therapeutic factors. Thus not only is it possible to observe the effect of drugs , but also the effectiveness of therapeutic measures to predict more accurately than is currently possible with conventional medical and genetic methods. Figure 2: Fingerprints of Urin in healty individuals (red) and CKD patients (blue).